Update Sept. 29, 2018: The National Oceanic and Atmospheric Administration has released new rainfall statistics and adjusted rainfall frequencies in Texas and Houston. 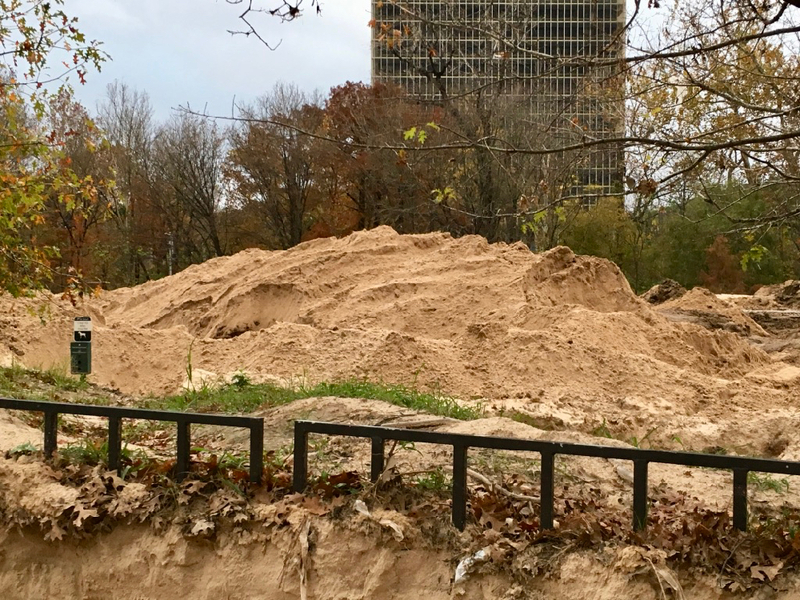 Updated Oct. 29, 2018, with recent photo of completed massive erosion control project on Buffalo Bayou. 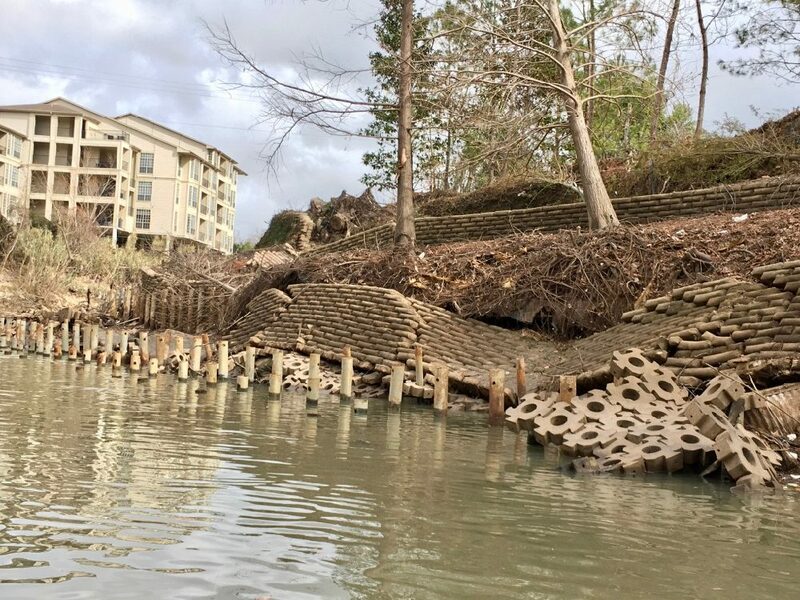 Over the past several years, in the wake of extreme floods, we have received numerous complaints about damaging “erosion control” projects on the banks of Buffalo Bayou – projects damaging not only to the natural functioning and ecosystem of the bayou but also potentially to people living and working up and downstream of the projects. Property owners bulldoze the banks, build massive retaining walls made of concrete block or sheet metal, dump piles of concrete construction debris into the bayou, strip and line the banks with concrete riprap. This in addition to stripping the banks of trees and vegetation, reshaping the banks, gouging out pathways, and landscaping with walkways and non-native flower gardens. Do they have the right to do this? Is it a good idea? Who owns the bayou really? What permits are required, if any, to do these things? And does the bayou itself have rights? Did Retaining Wall Make Flooding Worse? 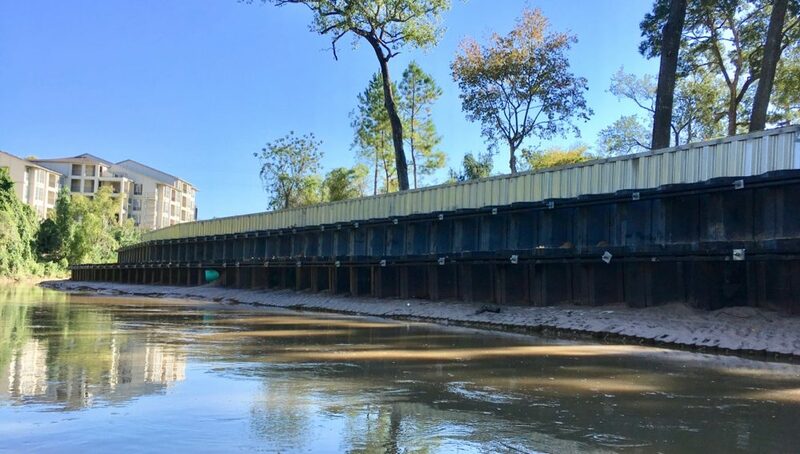 What happens if someone installs concrete riprap or a massive retaining wall that deflects the flow of the bayou away from their property and floods neighbors or damages public park property? This has happened repeatedly on Buffalo Bayou. 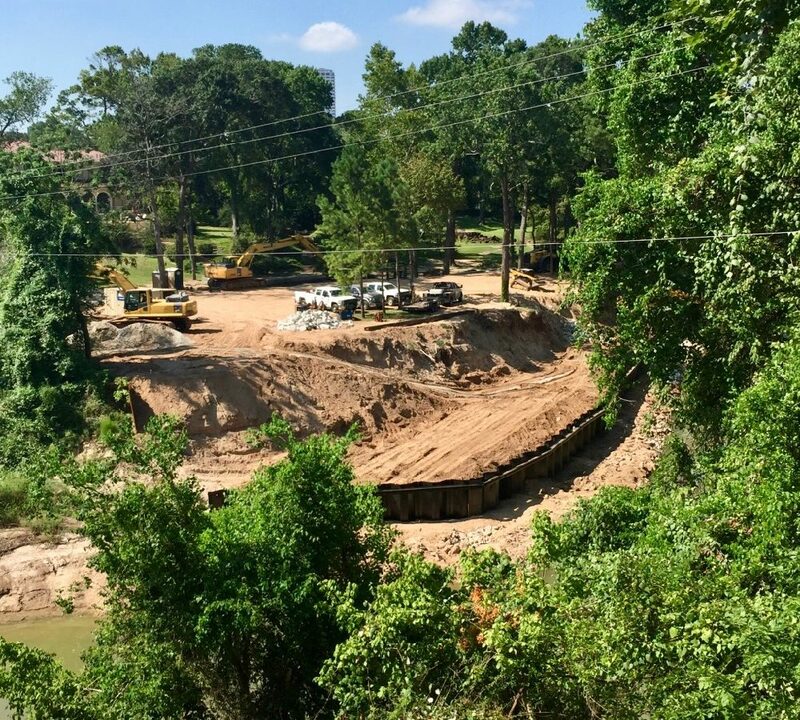 In one case, a large property owner in River Oaks, whose bank is likely affected by a large stormwater outfall directly across the way, installed a controversial concrete block wall along several hundred feet of bank in 2016, initially without a permit from the City of Houston. That armoring washed away during Harvey, and the property owner has now rebuilt the eroded bank, apparently dumping material into the channel, and installed a massive sheet metal wall that has alarmed residents across the bayou and elsewhere, threatening a narrow strip of land that the Houston Parks Board has been eyeing for a hike-and-bike trail. Is that legal? Is it right? Does it work? 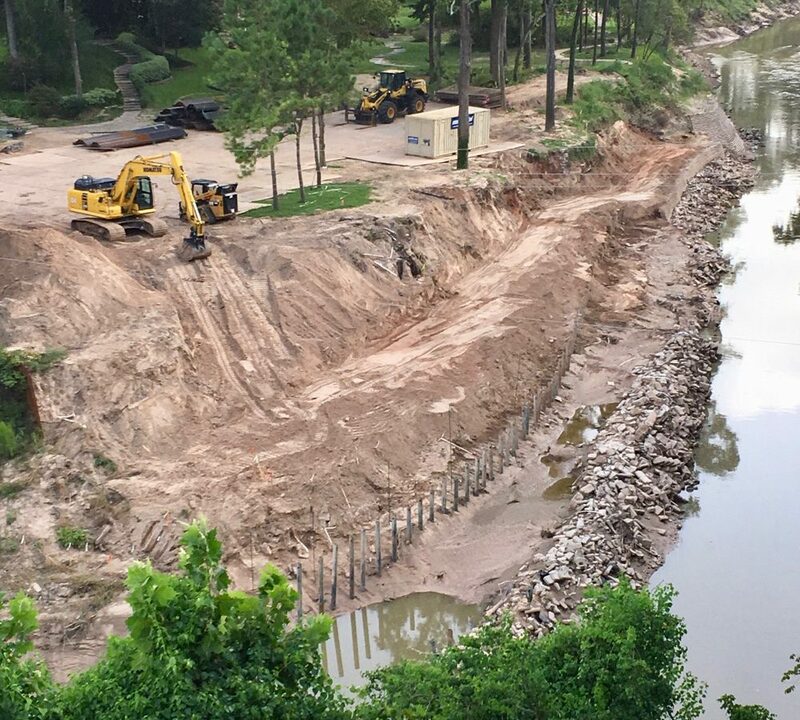 This extensive hardening of the bank of Buffalo Bayou, installed by a private owner in 2016, failed in August 2017 during Harvey, which washed away the bank. Photo January 2018. The failed concrete block hardening of the bank of Buffalo Bayou after the flood of July 4, 2018, and after reconstruction had begun. Grading, bulldozing, or generally digging up the bank and running heavy equipment over it damages the structure of the soil, makes it more prone to erosion, and increases stormwater runoff into the bayou, raising flood levels. 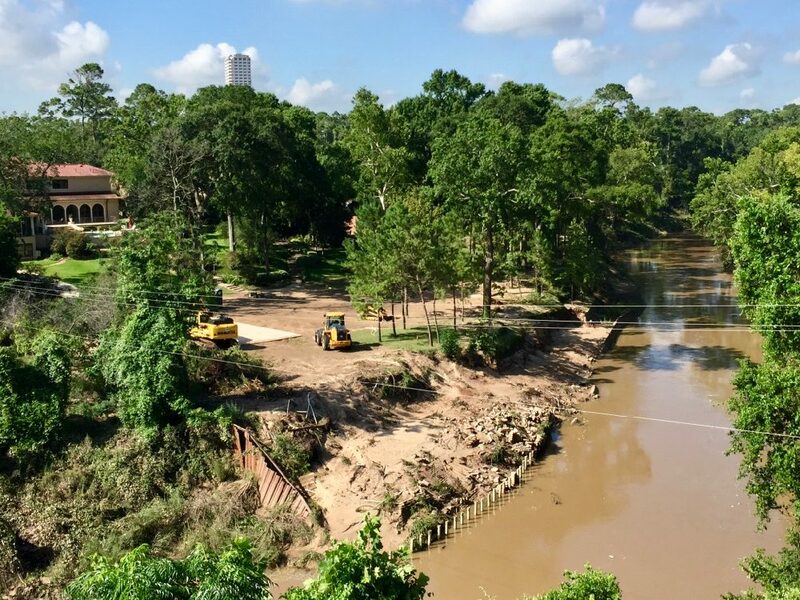 Another view of heavy equipment filling the shifted channel and rebuilding the bank of Buffalo Bayou. Photo July 15, 2018. 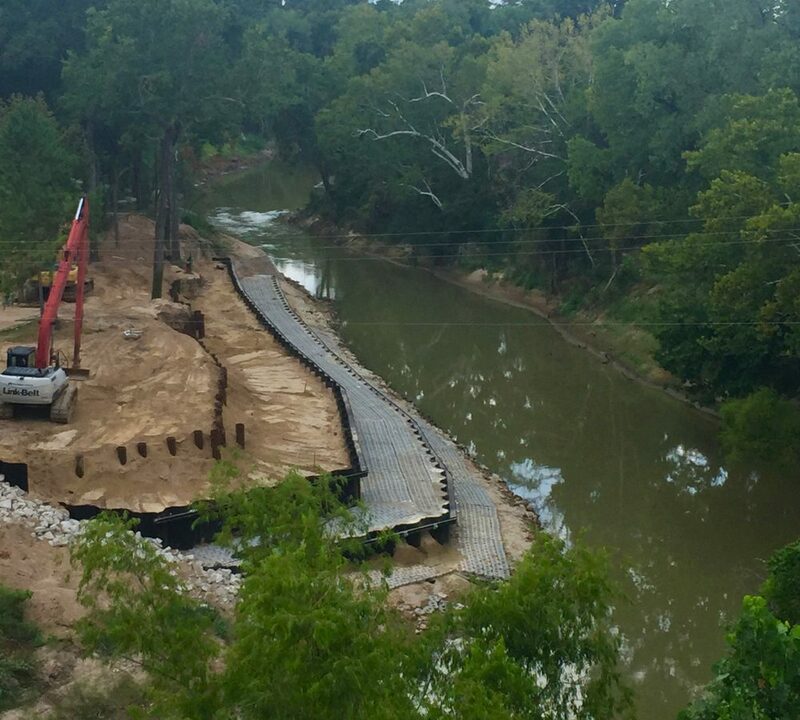 Reconstruction and hardening of the bank of Buffalo Bayou as of August 21, 2018. Residents across the way are concerned that this project will increase flooding and erosion of their property. The completed project on Oct. 27, 2018, as seen from Buffalo Bayou during a relatively high flow of about 550 cubic feet per second. Many people with property on Buffalo Bayou would think they own to the center line of the channel since the Harris County Appraisal District describes it that way and taxes it too. The state also made the flood control district responsible for the “conservation of forests,” (Sec. 4), as we have often pointed out, a responsibility the district routinely ignores. Forest, trees, vegetation, green space are vital resources for reducing stormwater runoff, absorbing water, protecting the banks, cleansing the water and air, and generally making us all safer and healthier. Normally the cut bank is the outside bend of a meander. But in this case the reference is “typically an alluvial bank along a straighter portion of the stream that is not actively eroding,” points out former assistant state attorney general Joe Riddell. The state definition of submerged lands seems approximate to the definition of Ordinary High Water Mark used to delineate federal waters. (See discussion below.) 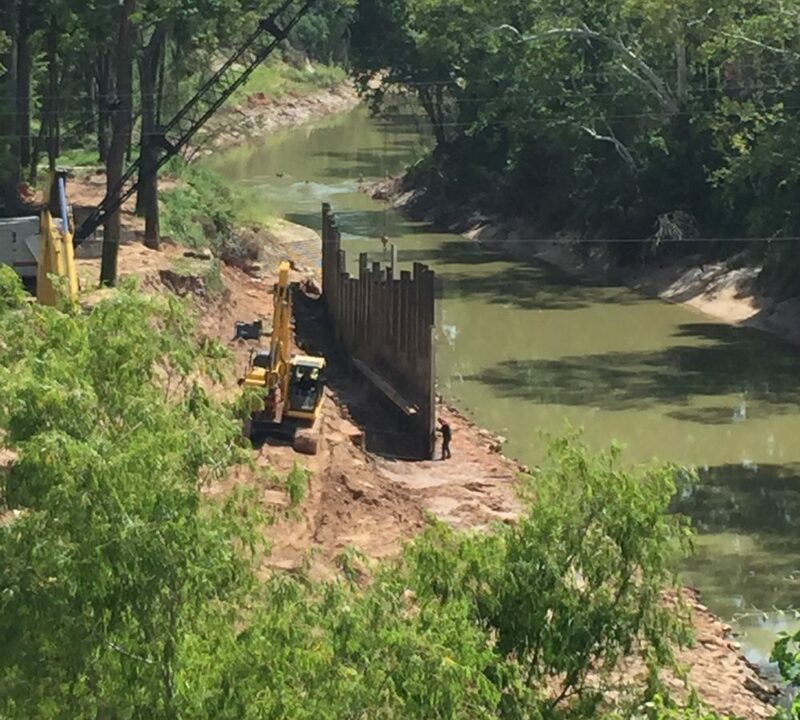 But generally the gradient boundary delineating stream bed ownership in Texas is slightly lower than the high water mark delineating federal waters, says Riddell, who worked in the natural resources division of the state attorney general’s office. Protection of our public streams and waterways, their adjacent floodplains and wetlands has two primary goals that concern us: ensuring the cleanliness of our waters and protecting us from flood risks by preventing any increase or rise in the existing flow of our natural drainage systems. While physical ownership of the bed and banks may lie elsewhere, the federal government is responsible for protecting the water flowing through Buffalo Bayou and all navigable streams, their tributaries, floodplains, and connected wetlands. (See discussion of federal waters below.) Under the Clean Water Act, the Corps of Engineers has this enforcement responsibility, along with the Texas Commission on Environmental Quality (TCEQ). The TCEQ is responsible for certifying that any permits issued by the Corps for discharging dredged or fill material into federal waters, including the bayou, complies with state law. In Texas a navigable stream is one that is useful even for pleasure paddling as well as, say, log flotation. The right of the public to access a navigable stream through public land is guaranteed in the Texas Constitution. The Corps, under the Rivers and Harbors Act, is also responsible for regulating any construction in or on the bayou and any dredging or filling of the channel. Dredging, by the way, is destructive to a stream’s ecosystem, can even cause more flooding, and creates a need for continuing maintenance and more dredging. To protect us from increased flood risk, the Federal Emergency Management Agency (FEMA), through the National Flood Insurance Program, also requires that construction in the floodways and floodplains does not cause an increase or rise in the flow of our streams. Or at least, not very much. A floodway is the main channel and deepest part of a river or stream and part of the floodplain. The floodplain itself extends beyond the channel and over a generally flat plain alongside the river. This is where, after Harvey, for instance, we saw massive accumulations of sediment deposited next to the bayou. That’s what flooding rivers do: overflow their banks, slow down, and drop out the sediment carried from upstream. It’s why the floodplains and valleys of rivers are so fertile. And also how rivers naturally build up their banks. FEMA, in order the minimize flood risk and regulate the insurance program, has more official definitions of “floodway” and “floodplain” and even several categories of floodplains based on 1. how much rain has to fall in order to flood those floodplains to a certain height (base flood elevation) and 2. how likely it is – considering the past record — that that much rain will fall. The base flood is the 100-year flood, which virtually everyone agrees is a ridiculous term and confusing. Currently in Harris County this base flood is 13 inches of rain within a 24-hour period. Our flood management/drainage system/policies are built on trying to handle that much water. The National Flood Insurance Program is a controversial taxpayer-funded program that subsidizes the reduced cost of private flood insurance premiums paid by renters, home and condo owners, and business owners in flood hazard areas in participating communities. Some people worry that providing cheap insurance to people who live in flood hazard areas encourages people to live there. On the other hand, the insurance program does make an effort to discourage some activities that increase flooding. Here is an interactive map of current Harris County floodways and floodplains. Here is an interactive map from the City of Houston of Houston region floodways and floodplains. Note again that these maps are expected to change with new data to be released in October. Floodways and floodplains will get larger. 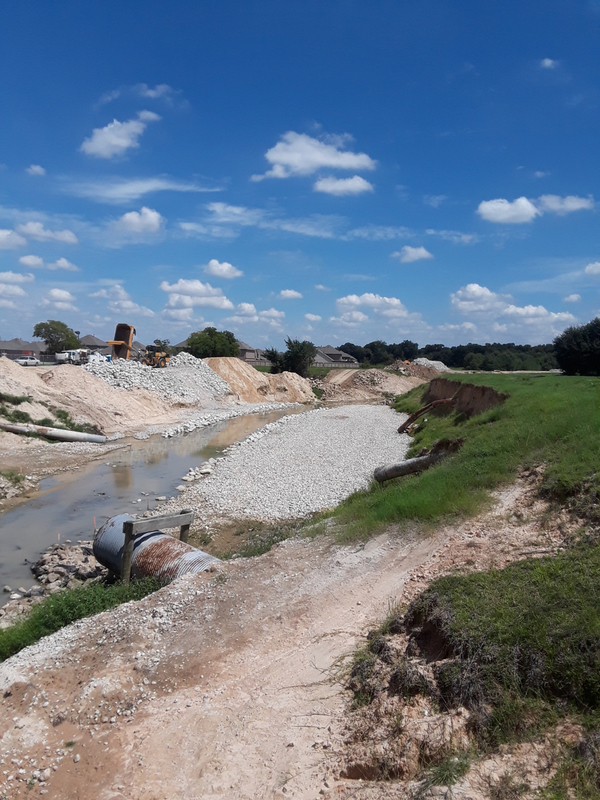 The engineering departments of the City of Houston and Harris County are responsible for making sure that construction and erosion control projects on the bayou and elsewhere meet this federal “no rise” requirement before issuing permits. Not that that’s easy to do when developers and property owners are wealthy, influential, and prominent members, even heads, of parks and other boards and commissions. City and county employees must also determine that projects have the proper approval from the TCEQ and the Corps. Apparently there are exceptions to the “no rise” requirement. (See page 6.) Or something is missing from the formula. Harris County allows zero increase in flood elevations in the floodway. “Under the conditions of obtaining a permit, no development or other encroachment, including fill, is allowed in a floodway which will result in any increase in the base flood elevations within the floodway during discharge of water of a base flood,” wrote Harris County Engineering Department Permits Manager Jesse Morales in an email. However, Harris County only regulates construction activities in unincorporated areas of the county. It’s unclear whether a proposed project would have to show no increase in flood elevations for your neighbor immediately downstream or across the way. That’s the Floodway. What about the Floodplain? No net fill means you can’t bring in dirt, for instance, without excavating an equal amount of dirt because that will reduce the stormwater storage capacity of the property and increase runoff into the drainage system. Except that you can compensate or “mitigate” by excavating somewhere else. Neither the City not the County addresses the usefulness or value of native trees and plants for controlling bank erosion and absorbing, slowing, and cleansing stormwater runoff. In fact, the flood control district actively discourages trees and vegetation along our waterways, known as riparian buffer, as impediments to conveyance. The district, apparently responding to public pressure for a manicured look, spends millions of dollars mowing the grass along our channels three times a year, which causes the grass to put its energy into growing upwards instead of growing longer roots that absorb stormwater and protect against erosion. Experts recommend a minimum width of ten feet of native plants and trees alongside an urban stream for effective erosion control and other benefits. Here’s some advice on restoring a bank on the bayou into a healthy, protective riparian area. Here are some Best Management Practices. 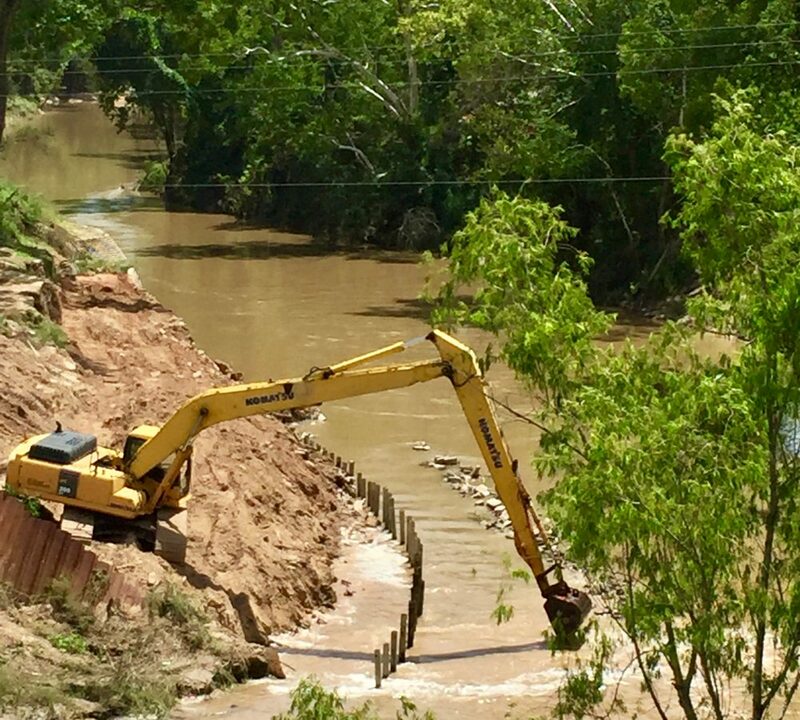 FEMA encourages the use of green or natural approaches and soft structures rather than hard engineering solutions like retaining walls and riprap to protect against bank erosion. In addition, many local erosion control projects mistake vertical slumping and sloughing, the most common type of bank collapse on Buffalo Bayou, for lateral erosion caused by the flow of the stream, and property owners spend a lot of money on inappropriate (not to mention ugly) projects. Erosion and deposition of sediment, a constant process, are natural and necessary functions of a stream. The federal flood insurance program recognizes the “the natural and beneficial functions of a community’s floodprone lands” and encourages “protection of natural floodplain functions” by providing lower premiums or greater discounts to communities that meet these goals. The current Harris County rating is 7 on a scale of 1 to 9, with 9 being the worst and 1 being the highest, offering the greatest discount (45 percent) on insurance premiums. The federal discount for flood insurance in Special Flood Hazard Areas (SFHA or 100-year floodplain) in Harris County is 15 percent. Outside of the 100-year floodplain the discount is 5 percent. The current City of Houston rating is 5, somewhat better than Harris County. That rating offers a discount of 25 percent for policyholders in the 100-year floodplain and 10 percent outside of it. The Harris County Flood Control District has guidelines, reviews plans submitted to city and county engineers, and consults with local floodplain administrators. But the district itself has no enforcement powers. In the name of flood risk reduction, both the City and the County continue questionable and costly practices of “improving” our waterways through deepening, widening, stripping, straightening, mowing, and even hardening the channels. (Not to mention installing and replacing bigger and bigger drainage pipes.) These unsustainable practices, geared towards collecting and moving more water as fast as possible, are considered outdated, ineffective, unnecessarily expensive, environmentally damaging, and even counterproductive by leading flood experts. The modern approach is to slow and stop stormwater runoff before it floods the stream, to manage rain runoff in place, to widen the natural floodplain of the river to allow it to slow and absorb floodwaters. And to get out of the way. Though the exact definition of federal waters is still being challenged in court, including by the State of Texas, the operating rule is that the Corps and thus the TCEQ regulates any activities (dredging and filling, for instance) taking place below the Ordinary High Water Mark (OHWM) of a navigable stream, including tributaries (even small creeks with bed and banks) and connected wetlands. Bank stabilization projects dumping fill for 750 linear feet or more along the bank of the bayou below the Ordinary High Water Mark (OHWM) require a permit from the Corps. Plans to dump an average of one cubic yard of fill per linear foot for 1,000 linear feet or more below the OHWM require a permit from the Corps. A pre-construction notice must be filed with the Corps for any project that involves a discharge into a special aquatic site (like a wetland) or is in excess of 500 feet in length, or that involves a discharge of greater than an average of one cubic yard per running foot below the OHWM. Some smaller projects – those that impact less than 1,500 linear feet of the stream, for instance – may still require a Corps permit but may not need a review by the TCEQ as long as they incorporate Best Management Practices – silt fences, for instance — for controlling erosion and sediment loss during construction until the bank has been stabilized. Here is more information about federal and state permits. Even the Flood Control District must have a permit from the Corps of Engineers to dredge and “improve” our waterways. The district has a General Permit to dredge and fill for “routine maintenance and repair.” It specifically prohibits deepening and widening channels, channelization or the use of concrete except to replace existing concrete, or damaging special aquatic sites like wetlands. That permit expires on Dec. 31, 2019. Just because the authorities will give you a permit to do something doesn’t mean it’s a good thing to do. In fact, the laws that are supposed to protect our environment, many of them dating from the 1970s, have been criticized for doing just the opposite: giving the power to government agencies to permit damage to the environment, destroy wetlands and streambanks, build in floodplains and floodways, cut down forests, etc. A renewed movement, based on ancient law, recognizes that rivers and riverbanks, the air, all the water, the oceans and shores, our environment and climate, even wildlife, are a public trust, and that our government has an obligation to protect our natural assets as the common property of the people, for the benefit of all, including for future generations. In other parts of the world, rivers in particular, and the waters and systems that nourish them, even trees, are recognized as living creatures, with the rights of personhood. For our own sake. If corporations can have the rights of persons, rivers should too. Respecting the process and power of nature, understanding how rivers and streams work, makes us all safer. 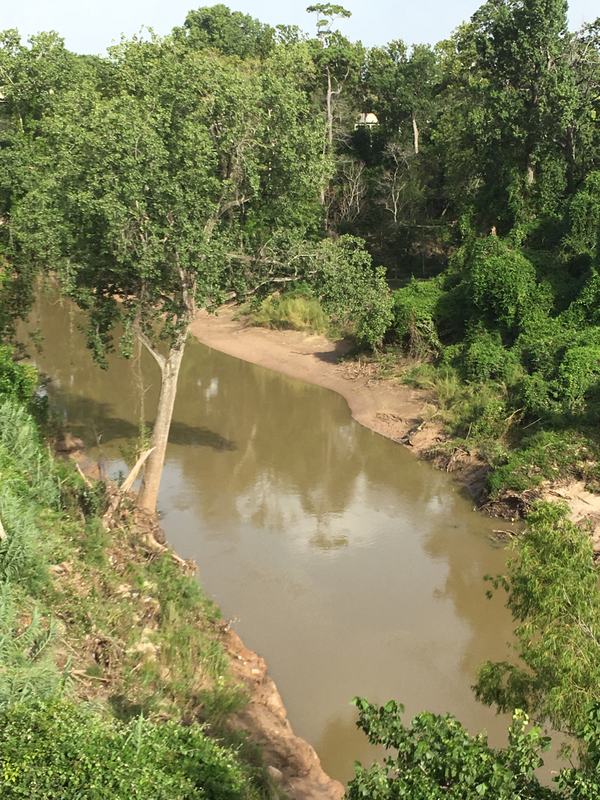 Buffalo Bayou immediately downstream of the extensive private erosion control project in the photographs above. Photo July 2018. What to do if you think someone might be dumping or building illegally on the bayou? Or in a way that is damaging? Here is how to check whether a property owner has a permit from the City of Houston. Here is how to complain to the City of Houston floodplain management office. Here is how to complain to the permits office of the Harris County Engineering Department. Here is how to complain to the Galveston District of the Corps of Engineers. Here is how to complain to the Texas Commission on Environmental Quality. In addition, you can report acts of pollution to air, water, or land, by calling the Houston Police Department’s Environmental Investigations Unit at 713-525-2728. You can also report chemical spills, possible illegal use of pesticides, and other environmental violations to the Environmental Protection Agency. Dumping of debris into ditches, streams, or bayous is a violation of the Houston Code of Ordinances Section 28-1. To report a violation or a maintenance problem, call the City’s Service Helpline by dialing 3-1-1.